Night raid offers an interesting look at 1930s east Asia through an alternate universe with prophesies and superpowers. It follows a group of Japanese supernatural agents in Shanghai and Manchuria. Admittedly I was very skeptical about this. Aggressive Japanese expansion into China is a touchy subject throughout Asia and its rarely covered well in Japan. My first impressions (the first five episodes) were that this would somehow attempt to justify Japanese actions in China, but I was pleasantly surprised when the portrayal of Japanese expansionism got progressively darker. This reads to me as a condemnation of Japanese actions leading up to the Second Sino-Japanese War. My primary criticism is the overuse of pretty generic main character types and pairings. I'm fine with the polar opposites, Aoi and Kazura. Sure, it's a pairing that has been done to death, but it works well enough. The Natsume and Yukina pairing, stoic protector and child like woman, is a bit much for me, though. If you enjoy history, even in a pretty casual manner, you will enjoy this show; even for those who aren't buffs on East Asian history. The story is pretty solid, and its pacing is decent. The beginning few episodes of this anime feel a bit episodic, then around the mid-point it changes to a more central-plot driven format. In some ways, this slightly reminds me of Cowboy Bebop. However, unlike the other, Night Raid 1931 doesn't have as much character development. It relies more on the plot to advance itself than, which doesn't come fully into the fore until around the mid-series. One of the central themes of this anime surrounds the A-bomb. It's pretty much anti-A-bomb. I believe it acknowledges in an indirect way (through a Japanese general mentioned in the show) General Giulio Douhet's theories regarding air warfare, mainly regarding mass bombing (which the A-bomb fits under, except the psychological factors are a lot more intense). It also acknowledges the concept of Mutually Assured Destruction (MAD), which was promulgated beginning in the 1950's. Despite acknowledging the some of the pro-sides of these arguments, such as the prevention of more world wars, etc. Night Raid 1931 doesn't really offer any real counter-argument other than an emotional one. And for those of us who are alive today because the A-bomb spared our grandfathers the trouble (and potentially their lives) of having to land forcefully upon the beaches of mainland Japan 14 years after the setting of this story, I have to say that the emotional argument comes off as a bit lazy, and is easily answerable with just as an emotional argument for the atomic bomb. In the end, I feel it could have done more to acknowledge the arguments of the other side, and try to answer/rebut them in a more competent manner. This isn't so much a knock on the story on this point, but more of a knock on the theme which transcends the story-line. That being said, if you enjoy history even a little bit, are looking for a good story with some moderate amounts of action and spy thrilling moments, and can tolerate challenges to your views/sensibilities even when those challenges come off as a bit lazy, then the show is definitely worth the watch. I love it!! And need MORE eps! 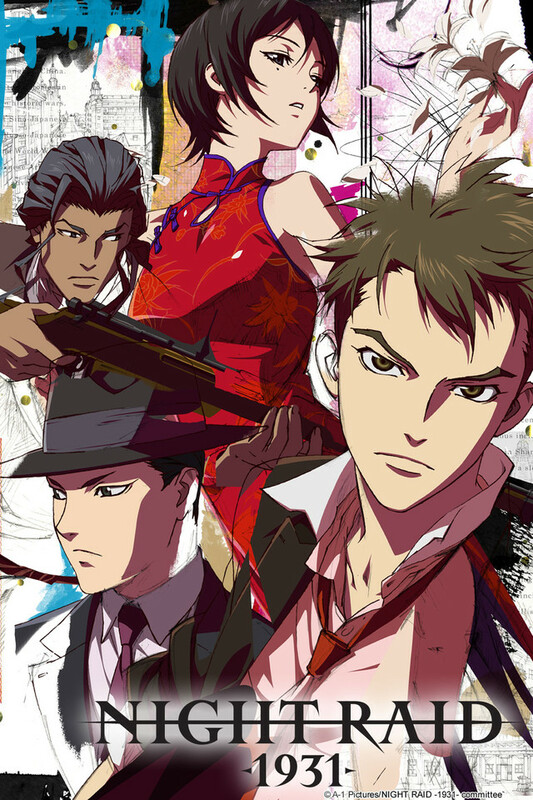 I love this show because that show remained me of cowboy bebop and Sherlock Holmes too. However this show are very interesting and loved it as soundtrack, characters, acting, and many things are amazed ever I had! Wish I can watch more than 16 eps. So, I'm glad that I did watched this show Hope that Night Raid getting more eps as soon! I admit to a lot of skepticism going into this show. Anime doesn't usually deal with WWII era events very well, and adding super powers to the mix didn't seem promising. That said... this was actually a good show. It dealt with Japan's gradual descent into militarism and all out war with China with insight and intelligence. The super powered espionage adventures, while more than a little weird, worked quite well. The characters were admittedly pretty archetypal. Stoic protector, sensitive girl, rogue, honorable soldier, semi-enigmatic spymaster... but they played their roles, and managed a couple of interesting twists. To sum up... a decent espionage thriller set in pre-WWII China, with superpowers and a fair bit of melodrama. I enjoyed it a lot more than I expected to. It's really a great anime and I enjoy anime like these to be honest that involve history and a early 1900's feel to it, some times I don't really understand whats going on because the first episode was great but then they go to the second where not everyone knows each other? It kind sets a confusion of why didn't the first episode start like that instead but it gets back to normal after that but all the episodes are netflix which is kinda odd that CR doesn't have it first.. Just thought I would put my 2 cents in and thanks for taking the time to read my review. This seemed like it could have been a really good action anime about people with powers and whatnot, but then all of a sudden it turned into political warfare and all kind of nonsense. I liked the beginning of the anime and then it stopped being all the things I enjoyed about this series. Probably should have paid attention to the fact that 1931 is in the title. Just didn't think it would be this sort of deal.